Saving predators is the focus of another or Team Bufo's research. We’ve talked elsewhere about using “teacher toads” that is, small live toads - to make predators sick, so they won’t want to eat toads in future. In recent research, we’ve extended this idea by adding chemicals to the toads that we offer to predators. Those chemicals are harmless but they make predators really sick – and we’ve found that this makes the learning experience much more effective. We’ve tested this method with several types of predators now, with encouraging results. Quite a few types of animals – including lizards and crocodiles – learn to avoid toads very quickly if we add the nausea-inducing chemical to small toads or to “toad sausages” – that is, ground-up toad flesh in a sausage form. Chris Spraggon trained Merten’s Water Monitors to avoid eating cane toads, by offering the lizard a dead toad containing a chemical that made the predator very ill (photo by David Nelson). Our most ambitious project so far has been with quolls, the marsupial predators that are at great risk of being fatally poisoned when toads invade. Stephanie O’Donnell and Dr Jonno Webb that quolls raised at the Territory Wildlife Park rapidly learnt to leave toads alone if we added a nausea-inducing chemical to the toads we offered. Encouragingly, those toad-trained quolls survived much better than their untrained brothers and sisters after we released them into the wild – despite the presence of plenty of toads. In current work in Kakadu National Park (jointly with park authorities), we have found that the trained quolls survive for a long time after they are released – long enough to breed. This is really exciting – it’s the first practical success in enabling Australian predators to deal with cane toads. We’ve received extra funding from the Australian Research Council and the Australian Government’s “Caring for our Country” initiative for this research program, and we’ve just heard that Stephanie won a major international prize for the paper we published about her study. We are expanding Steph’s work in a couple of ways. First, we are looking at responses of native predators to “toad sausages” – these sausages can indeed teach predators to leave toads alone, but we need to know who will eat the sausages, and how many of them, before we try this out in the wild. Second, we are testing our predator-training methods on some of the other species that are vulnerable to toads. Sam Price-Rees with one of the bluetongue lizards she has been radio-tracking. Our main focus is on lizards, because snakes seem like they are VERY slow learners, and crocodiles learn so fast they don’t really need our help. 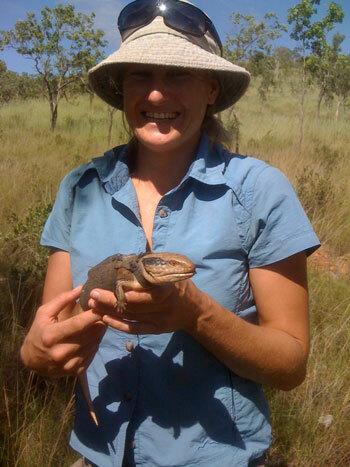 Sam Price-Rees has followed blue tongue skinks around in the Kununurra area, using radio transmitters to keep in touch with her animals. When edible-sized toads arrived at her study site, Sam trained half her lizards to avoid toads, then re-released them. The trained lizards were much more likely to survive than the untrained ones, suggesting that we might be able to apply taste-aversion learning to reptiles as well as to quolls. The big test was to apply this idea to the much larger goannas. 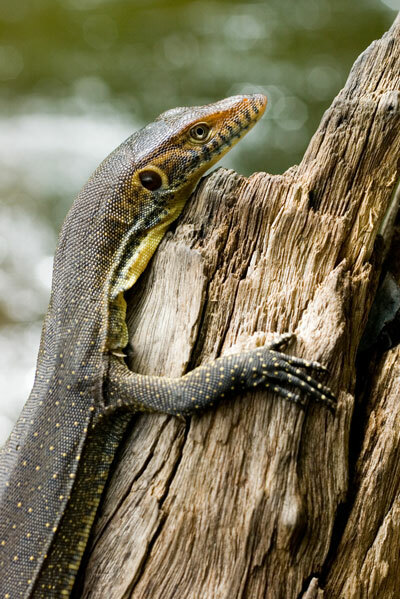 Jai Thomas showed that these giant lizards can learn to avoid toads; and Georgia Ward-Fear showed that this education helped goannas survive when the toads arrived. 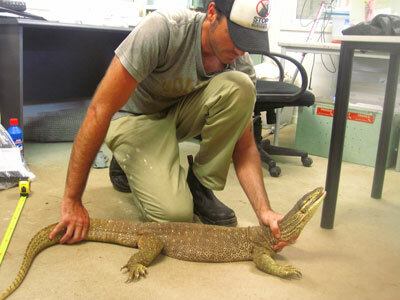 Jai Thomas and Georgia Ward-Fear have conducted similar studies with the much larger yellow-spotted goanna. And they found that "teacher toads" work!